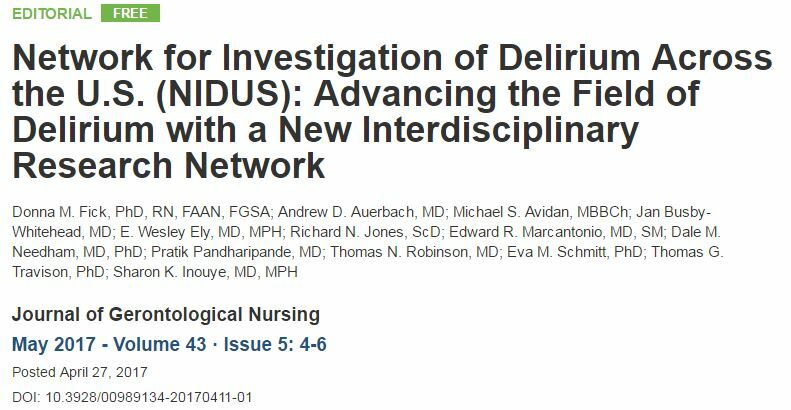 The Journal of Geronotological Nursing has published an editorial titled “Network for Investigation of Delirium Across the U.S. (NIDUS): Advancing the Field of Delirium with a New Interdisciplinary Research Network” in their May 2017 issue. The editorial describes the NIDUS program and provides a framework for how NIDUS will help advance the field of delirium research. Donna Fick, PhD, MSN, leader of the NIDUS Mentorship and Career Development Task Force, served as first author, with the additional NIDUS Investigators serving as co-authors. The editorial is available online at the Journal of Gerontological Nursing website. Follow this link or click the image below to view. Posted in News, NIDUS Announcements and tagged Delirium, In the news, NIDUS.